Alan Hewer, who has recently put his Great War dustjackets site online, asks his readers to send him scans of any examples not in his collection. I don’t have many dustjackets (Most of my library is made up of the cheapest copies available on Abebooks that don’t sound positively revolting.) but I’m sending scans of those that I have. Here, for a start, are two interesting books by women. Cicely Hamilton is best known for her William – an Englishman, with its very moving account of German violence in Belgium. 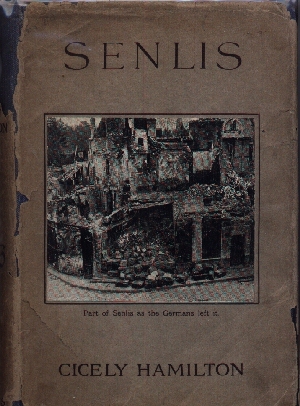 Senlis can be taken as a non-fiction first attempt at the theme. Senlis is a small town in Northern France, which was occupied by the Germans, and where they took tough reprisals, taking hostages and shooting local dignitaries. It’s written with great feeling, though maybe she doesn’t have enough material to fill a 128 page book. I saw Hamilton’s pre-war play Diana of Dobson’s recently, and one thing that the excellent Orange Tree production brought home to me was that even before the war she had a very strong sense of the fragility of civilisation, and of human vulnerability. The war made her even more aware of this. Both Senlis and William are expressions of it, as is her later novel, Theodore Savage, which imagines an air war so terrible that British civilisation is utterly destroyed, and humans descend to a brutal level. 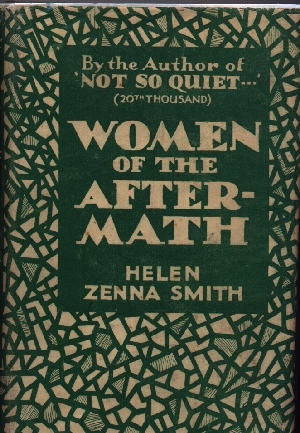 Women of the Aftermath is Helen Zenna Smith’s sequel to Not So Quiet…, and should be required reading for those critics still inclined to treat Not So Quiet as unmediated documentary truth – despite the excellent analysis by Angela Smith in The Second Battlefield, which reveals the book as an extremely literary construct, closely adapting situations and characters from Remarque’s All Quiet . The fact is that Evadne Price (Zenna Smith’s real name) was an accomplished pasticheuse. Her Jane series of children’s books are a perfect-pitch adaptaion of Richmael Crompton’s William series with not much changed except the gender. Later in life she became astrologer in residence for She magazine. I wonder, were her predictions based on genuine psychic knowledge, or on the ability to write cleverly in the astrological style…? Anyway, Women of the Aftermath is a terrific melodramatic read. At the end of Not So Quiet, Helen married Roy, a wounded soldier. In this book he develops a fiendish desire for revenge on life, which has rendered him disabled, and takes it out on his wife, punishing her viciously. She escapes, but only into a vile and decadent bohemia. The whole thing is written in the same overheated style as Not So Quiet, and is gripping, but not exactly credible. Even less believable is Shadow Women, the third book in the series, in which Helen becomes disfigured and reduced to the status of a down-and-out on the Embankment – until a lucky coincidence turns her life around. Yet in some quarters Not So Quiet still seems to be respected as authentic war literature (though Zenna Smith was only a child during the War years). I think it’s because it fills a gap. It is the book that some critics wish that a woman had written about her war experience, as gritty and tough as male narratives. So it’s a pity it’s a fake. This entry was written by George Simmers and posted on May 21, 2007 at 10:27 am and filed under novels. Bookmark the permalink. Follow any comments here with the RSS feed for this post. Post a comment or leave a trackback: Trackback URL. I’m interested in obtaining a copy or at least reading the four books following Helen Z Smith’s “Not So Quiet.” Do you have a suggestion on how I might do so? Copies are non-existent. Shame they weren’t re-published with the first of the series. No second-hand copies seem to be available. Probably the only way of reading the books is in one of the copyright libraries. I read the sequels to Women of the Aftermath in the Bodleian, Oxford.